Spa or hot tub staining or discoloration solutions. Treating Spa or Hot Tub Stains and Discoloration. Avoiding Stains and Discoloration every time water is added!!! Click on any of the above links, to see the complete selection of treatment products. Look for the presence of rusty, tan, blue, green, purple, gray, brown or black stains. These are typically due to the presence of heavy metals, such as iron, copper or manganese. Even if there is no obvious staining, the presence of heavy metals will cause water discoloration and possible staining, after chlorine or bromine are added or the pH is raised. Depending upon the severity of the problem, the products below can help you eliminate or avoid problems. The Stain Reversal Kit contains everything needed to remove the metal stains, eliminate the heavy metals and help prevent a recurrence, of the problem. The Stain Remover removes iron copper and manganese stains. 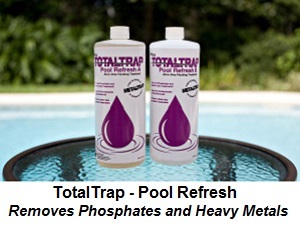 Pool Refresh-Total Trap helps eliminate heavy metals and phosphates, by filtering or vacuuming them out of the water. Click on any of the above links, to see the complete selection of models. Test the water chemistry and adjust the pH, total alkalinity, calcium hardness and cyanuric acid, as might be necessary. A ColorQ, All-Digital Tester can perform all of the common spa water tests and eliminates the color-matching and guesswork. Some tester models, such as the #2067 ColorQ PRO 9-Plus, perform all of the common water tests, plus copper and iron. Reliable water testing will help get the spa ready-to-go. Better Circulation helps make everything work more effectively. A Nano-Stick Clarifier is a 21st Century type of Water Clarifying product, that helps eliminate fine discoloring particles, using only the energy of light. Nothing to install - just hang it in the water. 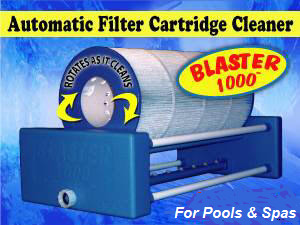 An Automatic Filter Cartridge Cleaner will thoroughly remove the debris between the pleats, assuring that all metal-containing sediments are washed away. How to treat iron, copper, manganese discoloration or staining? Dissolved heavy metals present, in spa or hot tub water, can lead to staining of the underwater surfaces, discoloration of the water or the appearance of blue to green, purple, gray or dark to black colored spots. Control of trace minerals, such as heavy metals and sulfur, and maintaining a proper overall spa or hit tub water chemistry is important, to help assure optimum water quality. Minerals such as iron, manganese and copper are the principal offenders. Iron and manganese can occur naturally in water, especially well water. It is the oxidation of dissolved heavy metals that can cause the spa staining and water discoloration problems, upon the addition of oxidizing spa chemicals. Copper is rarely found in municipal water supplies and usually finds its way into spas and hot tubs as the result of corrosion of the copper heater core or copper plumbing. Treatment of the resultant problem is usually possible with the proper techniques and chemicals. Heavy metal staining and discoloration can be removed, treated and prevented, with the use of METALTRAP Products, such as Liquid METALTRAP, METALTRAP Filters, METALTRAP 1-Micron Pre-Filter and POOL REFRESH. When the new source water contains sediments, a METALTRAP Dual-Cartridge Filter can removes both the precipitated metals, as well as the dissolved metallic ions, greatly reducing the risk of staining and discoloration. When well water is the source, there is a strong likelihood that problems will arise, unless a proper course of action is followed. If problems arise, refer to the Spa Problems Page, as a source of problem-solving information, broken down into various categories. Scroll down the page and click on the linked keywords, catch phrases or images, in the archived answers below, to access additional information, on that topic or product. ► Treating Iron Stains, When Using A Mineral Sanitizer? I have a 2004 model spa. I use a Mineral Spa Sanitizer and change the water every 3-4 months. In the past 6 or 7 months, I’ve started to get rust stains on the spa surface near the continuous circulation outlet (the outlet where ozonator bubbles come out). What is the likely source this staining. Thanks. What you are describing sounds like iron. Possibly, it is present in the source water used to fill the spa. The fact that you are using a mineral purifier limits the treatment options. Adding a stain remover and a chelating agent will eliminate the stains, but it will inactivate the metallic ions, from the mineral purifier. You should clean the spa with some MetalTrap Stain Remover and drain completely. Attach a MetalTrap Filter to the garden hose and refill the spa. As water passes through the cartridge-like MetalTrap Filter, iron and other heavy metals will be removed. A MetalTrap MT-10 Filter will remove up to 1 PPM of metals, from 10,000 gallons of water. The MetalTrap Filter should be used, whenever new water is added, and will last for years. I hope that I have provided the solution. ► Underwater Stains and More? I have a 375 gallon spa and have noticed considerable calcium build up on the walls of my spa. I just drained and cleaned the spa and could not get much of the calcium off the walls and jets. I have noticed that after about two months, the spa water, while clear when still, turns milky when the air is on. The calcium hardness right now is at about 100. What can I do to get the stains off the walls and jets next time I drain and clean the spa and how can I keep the water from turning milky after about two months? You seem to have several things going on. With a calcium hardness of 100 PPM, there should be no scaling. The cloudy water is probab ly the result of silt, being raised from spa floor. You might need a new filter cartridge, to improve filtration. The stains could be due, to iron. Calcium scale is not colored. Have the spa and source water tested for copper and iron. Stains can be removed with a MetalTrap stain Reversal kit. If the source water contains copper or iron, I suggest using a MetalTrap Filter to treat the water, as it is being added to the spa. The milky water could be the result of inadequate sanitation. The addition of a Spa Nano-Stick Clarifier can help remove fine particles, that frequently pass right through some filters. Are you able to maintain a stable level of sanitizer? If not, you need to pay more attention to this task. I hope that this information will be helpful. ► Treating The Stain And Discoloration Problem The Right Way? Hello We have a new hot tub with well water. The first time we filled it, we added the stain and control 1 with no concerns, water looked great. Then when we refilled it, the tub looks stained, because when we take a cup of water out of the tub it looks clean. Only difference was that the technician said we don't have to add the stain and control 1 till it is 85 degrees or the next day. Could this be the reason for the staining? How quickly are you supposed to put in the bottle? What you were told makes no sense. Waiting only assures that staining and discoloration are more likely to occur. At the very least, I would have told you to add the metal treatment, as the spa is being filled, so that it can react before staining or discoloration can take place. You will face this problem, every time you add water or refill the spa. It is not a one time only problem, but is an ongoing concern. Some metal treatments don't fare well, over time, and allow for a recurrence of the problem. Avoiding the problem is a better strategy. Attaching a MetalTrap Dual-Cartridge Filter, to the hose used to fill the spa, will remove dissolved metals and sediments, before the water is added to the spa. It is a one-time investment, that can provide effective mineral removal, for years of refills and top offs. Avoiding the problem always tops treating the problem. If the spa walls are stained, I would add some MetalTrap Stain Remover and drain and clean the tub. Afterwards use the MetalTrap Dual-Cartridge filter to refill the spa. This filter comes in 3 sizes and each will remove up to 1 PPM total, of copper, iron and manganese, from its rated volume. If the total metals content is over 1 PPM, it will treat proportionately less water. The metals removing cartridge is replaceable. The other cartridge removes sediments and is washable and reusable. The smallest size might be OK, but having a spare metal removing cartridge might be a good idea. I hope that this information is helpful. ► What To Do About Hard Water And Sanitizing? What is the best spa treatment for health generally and for hard water specifically? Thank you. How hard is hard? Over 400 PPM and calcium hardness problems need to be addressed. If you can, by all means use the softened water, if your water is of poor quality, is very hard or could contain dissolved metals. Otherwise, you could be in a heap of trouble. After the s pa is filled take a sample into a local dealer for a water analysis. You will need to adjust the calcium hardness, total alkalinity and the pH to compensate for the use for softened water. Once done, it should be treated like any other spa. Not all water softeners can remove iron and other heavy metals. You could use Liquid METALTRAP to treat any iron present or use the METALTRAP Filter to actually remove the iron, from the water. If you don't have soft water available, you should try to keep the pH closer to 7.2, but not below. Adding a calcium scale treatment can help. The Magnetizer is a device that helps to minimize issues, resulting for high hardness. It simply attaches to a pipe. Your best options are chlorine (dichlor or lithium) or bromine, along with something to help to reduce the amount used. Controlling usage helps to avoid further chemical build ups and lessens the downside of high calcium hardness. Adding an ozonator or a Solar UV Sanitizer can help reduce chlorine or bromine usage and make pH control easier. 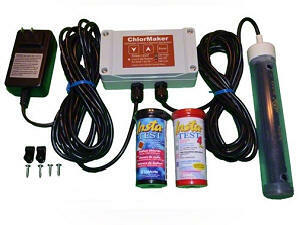 In place of chlorine, you could use a salt chlorine generator. There are several automatic models, as well as others that require no installation. I hope that I have been helpful. If so, please tell your friends and dealers about the website. ► Black Ring Around The Tub? We have not used our vinyl-lined hot tub for a number of months but it has been running and we have added chemicals and dichlor as needed. However it has developed a Black Ring at the waterline, which we cannot remove from the vinyl liner. We are changing the water, have used a spa cleaner, to clean the plumbing etc. However, the Black Ring is resisting all attempts with cleaning pads, cleaning products and baking soda, to remove it. Any help would be great. The hot tub is about 9years old. Thank you. Most likely the water contains copper, iron and other minerals. 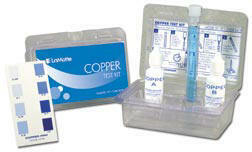 Test the tap water used to fill the spa for copper or iron, which are associated with stains. Copper can also be the result of heater corrosion, due to a low pH. Some mineral sanitizers can add copper, as well. The metals in the spa water may have precipitated onto the walls and resulted in stains and discoloration, which are rarely removed by simply adding a metal treatment or using common cleaners. Try this. Make a paste of some 500-mg vitamin C tablets and rub onto a stained area. If this works, the problem is positively due to metals. Add 1/2 pound of MetalTrap Stain Remover in a white sock, shut off the filter and scrub the walls. If the stain is removed, repeat elsewhere, as needed. ADD A DOSE OF Liquid METALTRAP FOR EVERY 0.5 PPM OF IRON OR COPPER. Liquid METALTRAP is phosphate-free and does not lose effectiveness at a pH of 7.8 or higher, as do most other metal treatments. If the stained area is too broad to be treated with the "sock", it may be necessary to lower the pH to 6.8, discharge all of the chlorine and add 1/2 pound of ascorbic acid. Wait 24-hours, after the addition of Liquid MetalTrap, before restoring the chlorine level. Thereafter add a dose of Liquid METALTRAP monthly or prior to adding new water, in order to avoid a recurrence. I hope that I have been helpful. If so, please tell your friends and dealers about the website. ► The Best Way To Treat Well Water? We have just purchased a new spa and have already gone through the hassle of filling it with well water (big mistake!) For the past month or so I have been playing the filtering game, cleaning iron covered filters, adding special chemicals to clarify etc. etc. I plan on getting my water shipped in the next time we drain and fill the tub. However, I would like to be able to "top off" in between draining and filling. My thought was to purchase the METALTRAP 1-Micron Pre-Filter, for Spas & Small Pools Item # PS-SF and the Liquid Metal Trap, 1-Quart Bottle Item # LMT-10. Is this the best approach, or is there something better that I should be using? Any advice would be greatly appreciated! Thanks in advance. The 1-micron will not remove the dissolved metals, just the sediments. A MetalTrap Dual Cartridge Filter System will remove both the sediments and the dissolved metals. Add a few ounce of Liquid MetalTrap before adding chemicals, for added insurance. 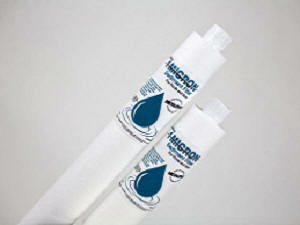 The sediment cartridge is washable and reusable. The MetalTrap cartridge is replaceable. You should get many years of use, out of the product. All you have to do is attach it to the garden hose. I hope that this will help solve the problem. ► Stain Ring Around The Spa? We have a spa in Illinois that is almost a year old. We took care of it over the summer as directed and just drained cleaned and filled it for fall. After adding some ph decreaser and starting some testing we noticed a rust colored ring forming we go it off, and did some more testing and it came back. We are currently draining again to refill. Can you help tell us why this happened? Most likely the water contains iron and other minerals. Test the tap water used to fill the spa for iron, which is associated with rust colored stains. The metals in the spa water may have precipitated onto the walls and resulted in stains and/or discoloration. Another option would be to use the METALTRAP Filter, as it can remove metal, before they get into the spa. The stains/discoloration are probably due to iron, copper and other trace minerals and are rarely removed by simply adding a metal treatment. Try this. Add 1/2 pound of MetalTrap Stain Remover in a white sock, shut off the filter and scrub the walls. If the stain is gone, repeat elsewhere, as needed. 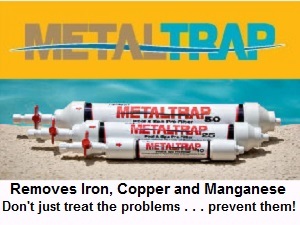 ADD A DOSE OF Liquid METALTRAP FOR EVERY 0.5 PPM OF IRON OR COPPER. Liquid METALTRAP is phosphate-free and does not lose effectiveness at a pH of 7.8 or higher, as do most other metal treatments. At the very least add two doses. If the stained area is too broad to be treated with the "sock", it may be necessary to lower the pH to 6.8, discharge all of the chlorine or bromine and add 1/2 pound of MetalTrap Stain Remover. Thereafter add a dose of Liquid METALTRAP monthly or use the MetalTrap Filter, prior to adding new water, in order to avoid a recurrence. I hope that this information will prove helpful. Click any image, for product and ordering information. I am confused. I want to filter the water coming from the hose, for manganese and minerals? I have a 200 gallon spa. Do I just need the pre-filter that attaches to the hose, or do I need something else also? Thanks. The MetalTrap Pre-Filter will remove fine mineral sediments and particulates, but will have no effect on the dissolved manganese, copper or iron. These any dissolved heavy metals are not removed, they will lead to staining or discoloration, after reacting with chlorine or other oxidizers. If you have sediment-free water, you should use a MetalTrap Filter to treat all new water additions. Even the smallest size, will last for years, as it can remove up to 1 PPM of metals, from 10,000 gallons of water. However, if sediments are present, you should use the MetalTrap Dual-Cartridge Filter. The first cartridge removes the sediments and is washable and reusable. The second cartridge removes any dissolved heavy metals, such as iron, copper and manganese. This cartridge can be replaced, but not reused. It can remove up to 1 PPM of heavy metals, from 28,000 gallons of water, so it should provide many years of being able to treat water used to refill the spa. In the long run, it is better to properly treat the problem and avoid the staining and discoloration. I hope that this has been helpful. ► Using The Right Pre-Filter? I bought a pre-filter (carbon). The vendor told me it was good for about 3 refill of my spa (450 gallons). I used it once and it doesn't work anymore (water don't go through anymore), but my water has never been so clear! I think I have a lot of copper in my water because it was always green when I filled it before using that pre-filter. 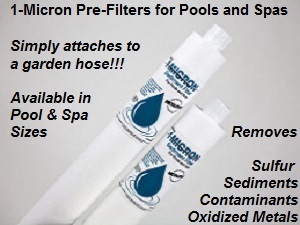 I'm thinking buying the "MetalTrap 1-Micron Pre-Filter, for Spas & Small Pools". Do you think it will be usable for a couple of refills? I know it says 10 000 gallons, but I want your opinion on it. The METALTRAP 1-Micron Pre-Filter will remove ultra-fine particles and many microorganisms. It is particularly useful where the source water is of poor quality. It should be able to be used to refill your spa up to 20 times, depending of the nature of the source water. However, your description of the water color and the mentioning of a copper possibility, leads me to question, whether a METALTRAP Filter would not be a better choice. The METALTRAP 1-Micron Pre-Filter will remove the metals that have precipitated, but not those in solution. The "green" color could be copper or iron or both. The METALTRAP Filter will remove all the dissolved metals, and will save you from having to deal with discolored water and stained surfaces. The METALTRAP MT-10 should be able to be used up to 20 times to refill the spa. You can always test the water, before and after, to confirm the Filter is still effective. The best way to deal with metals is to physically remove them from the water and not with chemical treatment. I hope that this information will problem helpful. ► Well Water Containing Sulfur? I observed floating particles in our hot tub. The flakes are yellow in color, have the texture of dead skin and can be up to half an inch in size in some cases. We use water direct from our well which contains 5 ppm of sulphur. When I asked our local dealer about the problem, he stated that this is due to the sulphur attacking the lining of the rubber hose plumbing. The sulphur eventually lifts off flakes of the hose which take on the color of the sulphur. He said that the remedy for this is to use a stain control product which keeps the sulphur particles suspended (sequestered) in the water thus keeping the sulphur from etching the rubber lining. He said that this can begin to occur after about sixteen months of use which makes sense in our case. I have begun the use of the stain control and will continue to observe for improvements. Have you ever seen this condition or heard of this remedy? You can't sequester sulfur. But there is a solution. The METALTRAP 1-Micron Pre-Filter will remove lots of the minerals that cause odors and discoloration. Use it every time you fill the spa and you'll save yourself a lot of problems. If this is the only source of water, I would bring in a sample of fresh water and have it tested for pH, TA and calcium hardness. I would allow the chlorine level to reach zero, add a 1/4 pound of METALTRAP Stain Remover and let the water recirculate for at least 12 hours. Drain and clean the spa. Use a METALTRAP 1-Micron Pre-Filler to treat the new water, as the spa is being refilled. Always pre-filter new water. Adding a monthly dose of calcium scale treatment is a good idea, if the hardness level is over 400 PPM. For best results drain and clean the spa, every 3-4 months. I hope that this information will prove helpful. ► Is It Black Algae? I have read all the problems submitted by others. Our discoloration is mostly dark green with many, mottled black spots. The green looks like oxidized copper. Is it still considered "black algae"? If so, what do you recommend? It is extremely unlikely that the problem is black algae! It could very well be a copper stain that resulted from corrosion of the copper heater core. Ask your self the following questions? Is chlorine or bromine being used? Has the pH been below 7.0, for extended periods of time? Are you placing chlorine or bromine in the skimmer? I suggest that you have the water tested for copper. If present, that will conform the corrosion. You will have to treat and clean the spa. 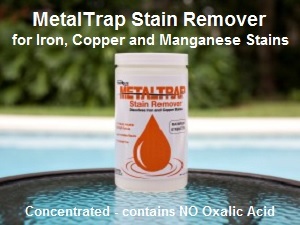 METALTRAP Stain Remover can be used to remove stains. After the removal, either drain and rinse the spa or add a dose of Liquid METALTRAP. If corrosion was the cause, you need to pay more attention to the pH and total alkalinity of the spa water. I hope that I have been of assistance. I have a 275 gallon spa and recently I emptied, cleaned and refilled the spa. I added the chemicals (bromine) in the usual way and the spa water started to turn brown in color. I brought a sample into a local dealer and he said that it was iron. It never happened before. Can you explain this? Where did the iron come from? That's the real question. If iron is not normally present in your household water on a regular basis, it might have ended up in your spa water because a fire hydrant was opened somewhere, up line, in the neighborhood. That caused sediments to be lifted off the bottom of the pipes and the rest you know. It is also possible that your water does contain an occasional trace of iron, depending upon the conditions at the water source, rainfall amounts, etc. Knowing the amount of iron present is helpful. Make sure that you add a quality metal treatment, such as Liquid METALTRAP, in sufficient quantity, for the amount of iron present. Add another dose monthly and prior to the addition of makeup water. The hope that this information cleared things up for you. I just changed the water in my hot tub and it is purple. I've had the spa for 5 years and this is the first time anything like this has happened. The water came out of the faucet clear and after I balanced it, the water turned purple. The only thing that was done differently this time was I used a pre-filter to eliminate the iron ring after filling. Is the water good and will it clear up? Any help would be appreciated. Thanx. Most likely the water contains iron, manganese, copper and other minerals. Purple suggests manganese and copper. Test the tap water used to fill the spa, as chemicals in the spa water may interfere with the test. The metals in the spa water may have precipitated onto the walls and may not show up in a water sample. A good option would be to use the METALTRAP Dual-Cartridge Filter System, as it can remove metals and minerals and contaminants, before they get into the spa. 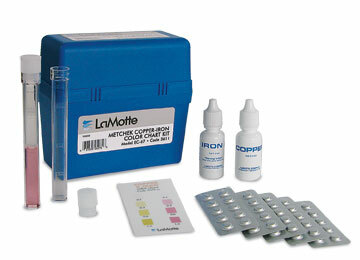 ADD A DOSE OF Liquid METALTRAP FOR EVERY 0.5 PPM OF IRON OR COPPER. Liquid METALTRAP is phosphate-free and does not lose effectiveness at a pH of 7.8 or higher, as do most other metal treatments. At the very least add two doses. Thereafter add a dose of Liquid METALTRAP monthly or prior to adding new water, in order to avoid a recurrence. I hope that this information will help clear things up. ► Only The Spa Is Stained? I recently purchased an iron test kit from your site, so I'd appreciate a bit more help. Enclosed is a picture of spa water which occurred when the spa person washed the spa filter in muriatic acid and then thoroughly rinsed it. There have been red rust stains on the spa. Cistern water tests "no iron" but water you see in the spa tests 0.3 iron. The spa uses bromine. The pool which uses salt chlorination and shows no rust stains. I've just replaced the spa gas heat exchanger (now cupronickel) and there's no other source of rust. The whole house water filter DOES, however, fill with a reddish material on the 1 micron filter we use to filter it out. We believe that the dirt on the hillside in the Virgin Islands (red) has a lot of iron in it. Please answer this: Why does the spa show iron stains and not the pool? Does the bromine precipitate any iron that is in the water? Does salt generated chlorine not precipitate iron so the pool does NOT get stains? Do you think we need a specific iron filter? Thanks. Red colored soil usually is high in iron. There is a possibility that copper is interring with the iron test and is showing up as iron. What I see in the spa are not iron stains. Copper stains from corrosion of the heater core are more likely. The action of chlorine or bromine, upon iron or copper is virtually the same. Iron stains are yellow to rust colored. Copper stains are blue-green to black. You replaced the heater coil, why? The pool operates with a salt chlorine generator and low pH is rare, because the SCG drives up the pH. Bromine or chlorine will not attack copper unless the pH is acidic. Most likely the pool's pH is always around 7.8 or higher. The spa is using bromine and bromine tablets are acidic. If the pH drops below 7.0, corrosion and staining could result. The photo seems to show that. If you used bromine tablets and did not add pH Increaser on a regular basis, your pH was too low. I think you need to do the following. Add several doses of phosphate-free, Liquid METALTRAP, to the pool and spa. Add another monthly. 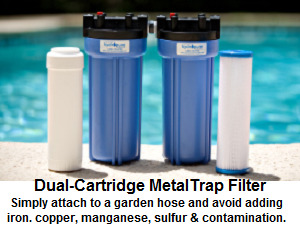 Use a METALTRAP Filter, while adding any new water to the pool or spa, to help remove particulated iron. 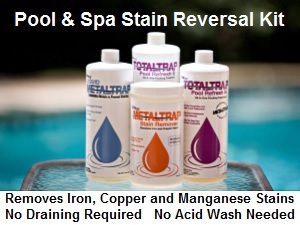 For cleaning of the spa stains try using a solution of METALTRAP Stain Remover. Refer to the page on pool staining problems, for more on this topic. I hope that this information is helpful. We were changing the water and we added the calcium hardness treatment. Then we add the bromine and it turns brown. We have changed the water regularly and this has never happened before. What is wrong? This sounds like a spa, but you didn't make that clear. Either way, everything applies. Pools/spas that turn color after bromine h as been added usually have a metals problem. This can be very common with well water. ASAP add at least a double dose of a quality metal Treatment, such as phosphate-free, Liquid METALTRAP. This might help avoid staining and should make an improvement. Bring in a water sample to a local dealer and have the water tested for iron, copper and other parameters. I suggest adding a dose of metal treatment for each 0.5 PPM of metals. Add another dose prior to adding new water. A monthly dose is an additional safeguard against a recurring problem. To help avoid such problems, I suggest using a metal removing pre-filter It can remove much of the metal content and help avoid such problems. I hope that this information proves helpful. My spa and pool are 4 years old. I have been treating my spa for what I thought was Black Algae for the last five weeks. The temperature finally cooled off so I could empty it and scrape off a sample. I took the sample to the pool supply place and they determined it was metallic. There are two spots, about the size of silver dollars, on the side of the spa. What could be causing this? Thank you. The stains could be the result of copper, in the presence of high levels of calcium hardness. The copper could have come from corrosion of the heater. Assuming that the spa and pool are gunite, try putting about 1/2 pound of pH reducer in a sock and place on a spot. Leave in place for about 30 minutes. Hopefully, this will dissolve the upper layer of plaster and remove the stain. Sometimes, it is necessary to use METALTRAP Stain Remover for this purpose. Sometimes black spots form, as a result of the use and abuse of calcium chloride in the plaster mixture. This problem was well described in the 1/15/03 issue of Service Industry News (Carlsbad, CA). If this is the case, there is nothing that is known to eliminate the problem, short of refinishing. I hope that the information will prove helpful. We have a fiberglass spa (500 gal) and it has developed green "gunk" (for lack of a better description). This stuff is in small chunks and adheres to the sides of the tub, our suits, of course it's filling the filter and it's covering the plastic parts of the filter. If it lands on anything while hosing out the filter, it sticks like glue. It can be scrapped off the tub and filter. What caused it and how do we get rid of it? We switched from bromine to chlorine, could that have caused it? We drained and cleaned the tub and filter before switching. Thanks. This "green gunk" could be copper, resulting from corrosion of the filter. Not a good thing! Have you been failing to maintain the p H at 7.2-7.8? Low pH conditions will corrode the copper heater core, in the presence of chlorine or bromine. Chlorine tablets should not ever be used in a spa, especially not in the skimmer. I suggest that you have the water tested for copper. If present, it is the result of corrosion and low pH. Add a double dose of a quality metal treatment, such as phosphate-free Liquid METALTRAP, and make sure that the pH is 7.2-7.8, at all times. You might be better off draining the spa, if my assumptions are correct. Otherwise, get back to me with the actual water analysis results and the type of chemicals being used. Have you ever considered an ozonator? It will make spa maintenance easier and produce better water quality, with fewer chemicals. I hope that this information will prove helpful. I have some blue-colored stains near some jets and on the bottom. Could this have been caused by copper? The spa is about 300 gallons and is about 12 years old. I use bromine tablets and a non-chlorine shock. Is there anything that I can do? Thanks. The blue-colored stains are probably due to copper. The likely source is from your heater. If you're lucky, the damage to the heater was not serious. You didn't mention that there was any discoloration of the water, so I will assume that there was none. That being the case, you probably don't have much copper in the water. A Copper Test should confirm this. To avoid staining, I suggest that you add a dose of a quality Spa Mineral Treatment, such as phosphate-free, Liquid METALTRAP, to the spa water. The next time that the spa is emptied, try cleaning the stained areas with a solution of METALTRAP Stain Remover. Make sure that you use rubber gloves and eye protection. Rinse any metal parts with water, to remove the chemicals and the dissolved stains. Rinse spa clean before it is refilled and don't forget to add a dose of the Liquid METALTRAP, as it is being refilled. The cause of the copper problem was probably due to corrosive, low pH conditions. In the future, make sure that the pH remains in the 7.2-7.8 range. To help stabilize the pH, the total alkalinity should be 80-120 PPM. I hope that I have been helpful. Keep enjoying the spa. ► Stain Removal In Pool-Spa Combo? I have a large in-ground pool/spa, 7 years old, kidney shaped, about 30,000 gallons. It has had a Copper Ionization + ozone system on it for about 5 years. Over the years, the pool service did not maintain the pH properly and the pool has developed gray stains. A drain and acid wash is recommended by my pool service but I am reluctant to proceed due to the expense and the impact it has on the pool surface finish. My pool technician, has suggested that he has been successful in treating stains like these with the addition of Muriatic acid to the water. I am willing to give this process a try as it appears cost effective and should not damage the finish. I would like to try the treatment on the spa first, and see if it is successful. If yes, than I would like to do it to the whole pool. What are the pros and cons to this approach? How much Muriatic acid needs to be added for success? My spa is 8 feet in diameter. How many gallons of acid for the 30,000 gallon pool? How long should I let this circulate? Are there different strengths of Muriatic acid? Which one should I use? What is the best way to restore the water chemistry after this operation? Thanks. A pool or spa be subjected to an acid bath as a means of stain removal. Basically it dissolves the top surface and hopefully tak es the stain with it. Lowering the pH will subject the metal parts to corrosion, including the heater, if chlorine or bromine are present. Therefore, treatment should be in terms of a short period of time - a day or less. This is important to help minimize the possibility of excessive surface etching. You have to add enough acid to lower the pH just below 7.0. A pH of about 6.8 should suffice. Use the brush to scrub the surface. Bypass the heater, if possible. A better and safer method is to use the METALTRAP Stain Removal System. Once the discolorations and stains are removed, use The METALTRAP Filter, for all future water addition and the problem should not recur. Restore the pH and TA. Because the addition of the metal treatment will interfere with the copper being introduced by the ionization unit, I would recommend using a polymer algaecide for a month or two, while the copper ion content is re-established. I hope that this information proves helpful.